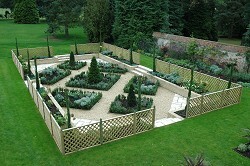 We provide a complete garden design and build service, creatively and sympathetically carried out to suit all tastes. We employ a skilled designer who can either work within your own guidelines or be given a free range to create their own beautiful design for you. Designs are created using 'mood boards' and presented as pen and ink drawings for you to study before any work takes place. Together with all the ground works and hard landscaping features one would normally associate with a new garden, we also have access to a vast range of planting ideas. These can include mature trees, avenues and orchards, hedging, water gardens and stream features etc. Our landscape team are also experienced plantsmen who can provide guidance on how to look after your new garden once it becomes established. Laying turf during the final stages of a new garden project.